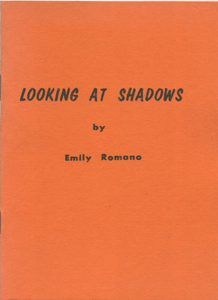 Emily Romano’s work in this modest chapbook, self-published in 1979, gives a good idea of the state of the art at the time. Her skillful handling of the 5-7-5 or near-so form is among the best of the day, feeling fluid and unforced, which, as those who have tried the rigorous syllable count know, is no easy feat. a few mice droppings . . .
not a breath of wind. Loved the tire swing haiku, ‘not a breath of wind’ is a stunning line. Thanks for sharing. ” a tire swing” foreshadows some of her fine work to come. Though I like ” lengthening shadows” & ” my shadow falls”, they are more along the line of Ginsberg’s American Sentences. I enjoyed this book and seeing the credits in the book adds to the history. I noted for example that this wonderful poem appeared in Modern Haiku in 1976 – and now this week here. Many of these poems also express the Wisconsin countryside for me, and I remember the elms. poets. Thank you for sharing.